Good news, Planeswalker! In many Magic sets, you're battling over matters of life and death. Planar invasions, ancient evil, widespread genocide . . . it's exhausting. Time for a little R&R. Tucked away on the plane of Kylem is Valor's Reach, a stadium where mages from around the world (and, perhaps unbeknownst to the people there, beyond) come to hone their craft in front of adoring crowds. It's more sport than combat here, and showmanship is the name of the game. Especially beloved are the two-on-two contests, and Battlebond was made for Two-Headed Giant games. Grab a teammate and get ready to rumble. Fun shared is fun multiplied, and Two-Headed Giant is one of the most fun formats around. If you're not familiar with it, here's a quick overview to get you and a teammate up to speed. In Two-Headed Giant, you sit next to your teammate across from another team of two. Each player needs their own deck, but you have a shared life total that starts at 30. If either one of you gains or loses life, the team gains or loses life. To start the game, everyone draws seven cards. The team going first makes their mulligan decisions. You and your teammate can look at each other's hands at all times, including when deciding on mulligans. Because Two-Headed Giant is a team format, each player's first mulligan is back to seven cards, then six, and so on. Neither player on the team going first draws a card on the first turn. You and your teammate share the turn. You both draw during your draw step. You can each play a land during one of your main phases. You can cast spells, activate abilities, et cetera in any order you want. You both declare attackers and blockers together. But what you don't share is resources. Your lands are your lands, their creatures are their creatures, and this land is my land, this land is your land. I'm saying you each have your own lands. Moving on. Remember that anything that says "you" means you, not your teammate. But there is a new term we're introducing: "your team." Any card that refers to "your team" refers to you or a teammate. If you're not playing a team game, "your team" just means "you." Teammates are players who started the game actually on your team, not just "opponent I happen to be working with right now even though they will receive a knife in their back soon." For example, in a traditional Commander game, you have no teammates. When it's time to attack, you and your teammate decide which of your creatures are attacking. For each of them, choose which opponent or opposing planeswalker it's attacking. Your opponents' creatures can block any attacking creatures coming at their team, no matter which opponent or planeswalker is being attacked. From there, it's basically the Magic you know and love. Talk to your teammate; that's about half the fun. Out-think, outplay, and outlast the other team, securing victory. That's the other half. Now for the mechanics. Partner with . . . The most celebrated duos at Valor's Reach can be found inside some Battlebond booster packs. Fighting out of the corner to my right, hailing from parts unknown, they are the undisputed champions of this article . 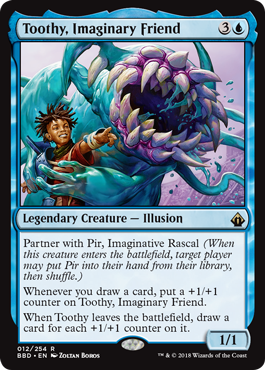 . . Pir, Imaginative Rascal and Toothy, Imaginary Friend! Second, each pair of partners can co-serve as a deck's commander. 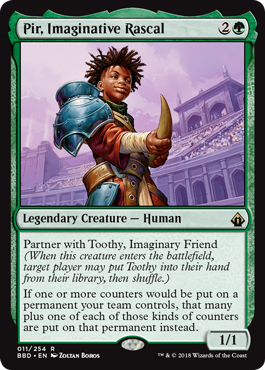 This is largely the same ability as the original partner, which debuted in Commander (2016 Edition). In fact, this part of the ability doesn't do anything if you're not playing Commander. The only difference is the named partners can be co-commanders only with each other and not with any other creature with partner. You can't partner Toothy with Vial Smasher the Fierce, for example. Note that not all the partners in Battlebond are legendary. The ones that aren't can't be commanders at all. There aren't many things you have to do by yourself in the arena of Valor's Reach, but casting spells is generally one of them. At least, until the new assist ability. Here's Huddle Up. As you cast a spell with assist, you choose another player. This can be your teammate (who should be inclined to help you) or an opponent (who you can sometimes manipulate into wanting to help you). That player can help you by paying any amount of generic mana toward the total cost of the spell. That player can't help with the colored mana requirements. For Huddle Up, you have to pay the U, but another player can pitch in up to 2. You don't choose the player until after you've revealed the card with assist and made all other required choices, including targets. So the other player will know what they're signing up for. If they don't want to pay, you can either foot the entire bill yourself, or choose to back up and not cast the spell at all. Teamwork makes the dream work, so they say. And if the dream is bashing your foes, nothing works quite like making your team enormous. Originally seen in Oath of the Gatewatch, support spreads the +1/+1 counters around. 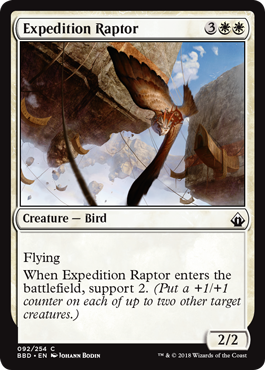 Also originally seen in Oath of the Gatewatch was this returning raptor. The rules for support haven't changed. The number after support is the maximum number of target creatures you can choose to each get one +1/+1 counter. If a creature has a support ability, that ability can't target the creature itself. If a sorcery or instant tells you to support, you can choose any creatures as the targets. You can choose fewer than the listed number of targets if you want to, but don't forget about your teammate's creatures! Keep your friends close and your foes closer with a new cycle of cards that ask you to decide between two effects for each player. Here's the green member of that cycle, Pir's Whim. When a "friend or foe" spell resolves, you first choose one of those labels for each player, including yourself. In most situations, you'll want to label yourself and your teammates friends and your opponents foes, but you're free to choose how you like. If you want to show your teammate who's boss, and there are no barbershop windows handy, then call them a foe. Should work out great. After friends and foes are decided, all friends take the listed action at the same time. Immediately afterward, all the foes do their action at the same time. This is all while the spell is resolving, so no one can cast spells, activate abilities, or take other actions in between. If any choices are involved in an action, those choices are made in turn order among friends (or foes, or both, if applicable). For example, when you resolve Pir's Whim, each friend searches their library for a land card. 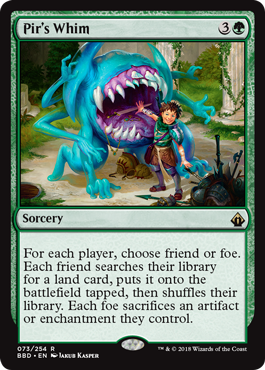 Those lands cards are all revealed simultaneously, so no friend knows what any other friend has searched for before committing to their choice. Then each foe in turn order chooses an artifact or enchantment they control. This means that each foe will know what previous foes have chosen at time they have to choose. Then all those artifacts and enchantments are sacrificed at the same time. The label of friend or foe applies only for the one spell. If you cast another "friend or foe" spell later in the game, you get to choose friends and foes all over again. The crowd is hushed, all eyes on the darkened arena entrance. The playbooks are chosen. The spells prepared. You lock eyes with your teammate. The moment you've trained for, yearned for, sacrificed for . . . it's here. Your music hits. The people explode. Showtime.